Appletree of Discord is the debut solo release from El Soter (aka Blaž Erzetič), a member and the mastermind of the Slovenian electro-pop duo Amateur God. While the Amateur God project has released three albums that have been described as "metallic", "droning", and "mellow", Blaž felt that the material written for Appletree of Discord was such a far cry from his previous work that an entirely new project had to be formed. Not being very familiar with his previous work, I found this album to be almost exactly as the music of Amateur God has been described. The idea that keeps coming to mind as I listen to the album is that the title couldn't be more appropriate. For the most part, discordance abounds. The first several tracks combine feelings of melancholy, anger, and euphoria in such a way that projects emotional confusion. Electronic dance beats are punctuated by NIN-like grind, while a haunting ambiance seeps through the cracks to project a not-so-subtle dread. The lyrics are dispensed in a minimal, monotone delivery that takes a backseat to the synthesized atmosphere. While I suspect that the creative approach of Appletree of Discord may be appealing to the disillusioned, self-effacing electro-Goth crowd, the majority of the album is too disjointed for the average listener to absorb. Perhaps it's simply a matter of raw emotion flowing directly from El Soter, with very little filtering or manipulation, but as honest as it may be there's a limited appeal that will find most listeners left unfulfilled. The album is not entirely comprised of complex arrangements, however. The fifth track of the disc, "Not Coming Back", provides a glimpse into a more straightforward approach. A curious, spacey synth riff carries the song along, sparking an interest that had been subdued by the droning of the preceding tracks. The addition of backing vocals from Metka Rogelja lends feminine comfort that offsets the impersonal, filtered voice of Blaž. The track that speaks loudest to me is "Girl in Pink, For Example". An acoustic guitar opens this serene instrumental, which combines a fairly traditional rock structure with El Soter's trademark introspective ambiance. While the name may seem odd, the song itself is a perfect vehicle with which to examine ones own emotions. "Chaos Based Directions" soon follows with a slightly more up-tempo pace than can be found on the rest of Appletree of Discord. Once again the song flows with a traditional structure and melody, but there's no mistaking the somberness that lies just under the surface. Another point worth noting is that the album is opened and closed by Helen Filipčič reciting some of Emily Dickinson's poetry. 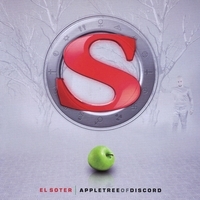 While Appletree of Discord has some intriguing moments, the overall sense of minimalism and haunting self-analysis leaves the album open only to the most disenchanted among us. Those with a fragile psyche proceed at their own risk.